Shocking in so many ways! 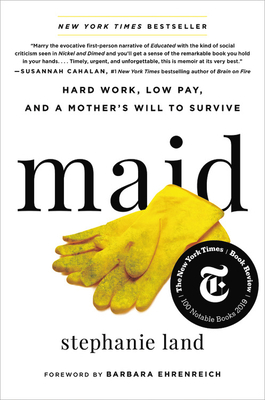 This memoir is a painful and provocative look at trying to survive on minimum wage and fighting poverty while on public assistance. The author, a single mom, candidly talks about the invisibility of cleaning strangers’ houses and the loneliness and heartbreak of struggling to provide for her daughter. Her detailed stories reveal so much more than any article I’ve ever read on this topic. As I read this touching debut, I constantly had to remind myself that it was a memoir. Stephanie Land’s honesty about her struggles as a single, poor mother should make us all stop and think: think about how we truly may not know what is going on in someone else’s world; think about having to do whatever is necessary to make ends meet—and having the right to feel proud about it.